In blog form, anyway. I spent countless hours on this beautiful motorcycle racing game with combat mechanics built in. I first played it on the 3DO, a system barely anyone remembers any more. The gist of the game is that you were in a motorcycle road race with, I believe, twelve or fourteen other computer riders. You could use a variety of weapons including clubs, crowbars, nunchuks, and cattle prods to knock them out of your way in an attempt to finish third or better. Failure to do so meant you had to repeat the race and could not proceed to the next level. The version on the 3DO had one of the best soundtracks to any video game...ever! It's actually where a friend and I discovered Monster Magnet. It also contained Paw, Soundgarden, Swervedriver, and Therapy?, all of which made for a much more intense driving experience. With the popularity of the game, six sequels were spawned over time. The next one that hooked me was on the original PlayStation. As you can see above, the graphics got considerably better on the newer machine, but the 3DO version and its soundtrack will always hold a special place in my heart. That said, I was just as addicted to the PS1 version as I was to the 3DO. I spent hours and hours knocking opponents with names like 'Skid' off their bikes with a chain. 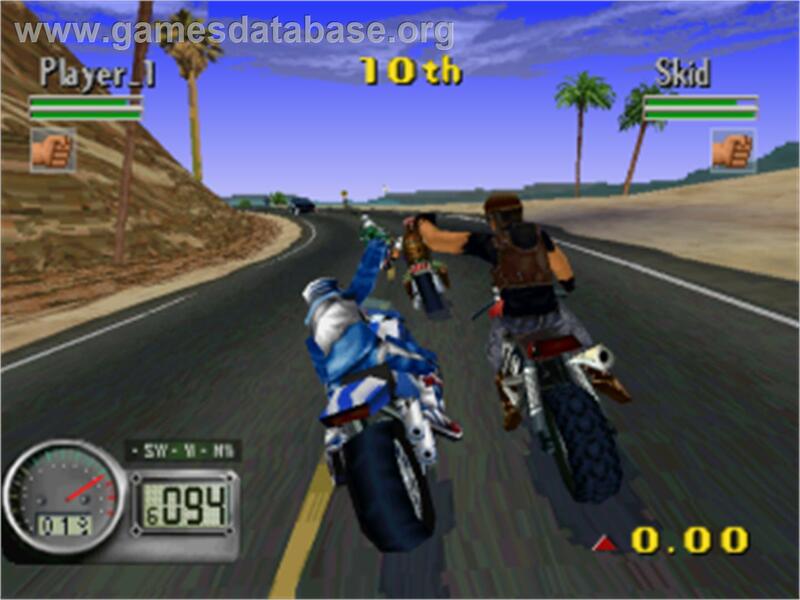 Unfortunately, there hasn't been an original Road Rash game made since the Game Boy Advance put out a port in 2003. Come on, EA! This game is one of the best ever! Get off your duff and make a new one for the next-gen consoles we're all about to buy. Who doesn't want to see another Road Rash? Violence, illegal street racing, more violence. What's not to love? No, seriously, I'm done writing. There isn't a lot to this game beyond the thrill-a-minute action and the flawless mechanics. They kind of tried to add a story in the later versions where you level up your bike and deal with specific NPCs in order to do so. I'm sure something like that will be required by today's sophisticated gamer. However, as long as you get the racing and the combat right, the rest is just gravy. Hope you enjoyed this little stroll down memory lane. Maybe some new games will come out soon that I can review (sigh!). Penalties: -1 for being maddeningly hard to level up on occasion. Remember back when you just couldn't beat a level, no matter how hard you tried? Well, this was made back then. Nerd Coefficient: 9/10 Standout in its category.